The Highland Park Field Guide by KCET. 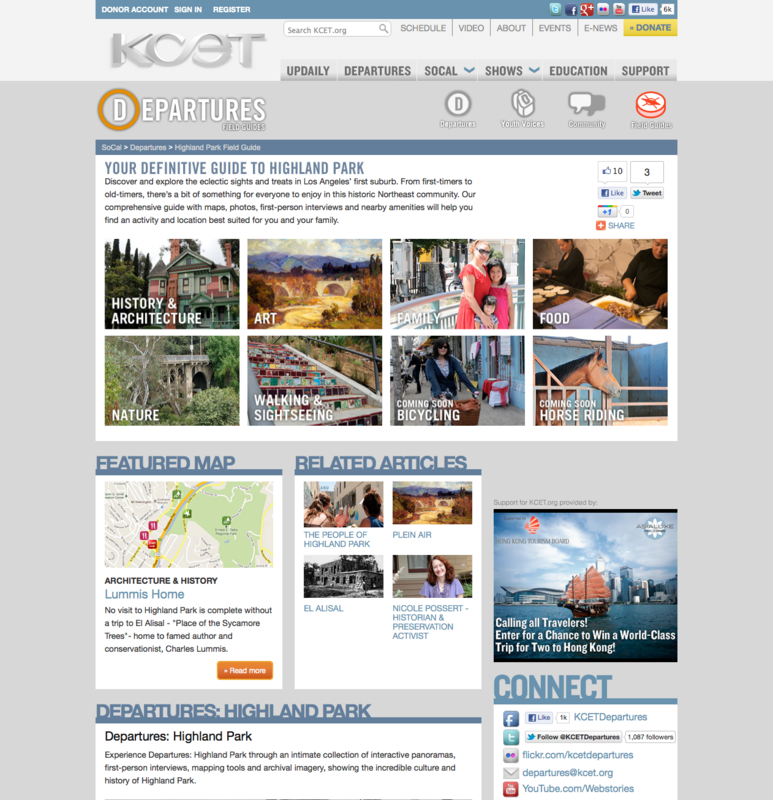 KCET, a public television station based in Los Angeles, has been working for the last few years on Departures, a project designed to engage “community residents, non-profit organizations, schools and students, in the creation and procurement of relevant and relatable content.” Included in this work are a series of online interactive field guides to various neighborhoods in their region, and most recently launched is one on the historic community of Highland Park (which features the Lummis House, Heritage Square, and the Southwest Museum). Given that KCET is one of the major public tv stations in the nation, the field guides are beautifully produced and include lots of video. Architecture and History in Highland Park in KCET's Departures. For those of us interested in engaging people with places, take a look at the “Architecture and History” section of Highland Park. It features a Google map with icons of various places (e.g., museums, historic sites, churches, parks). Click on an icon and a small window pops-up with a photo, directions, and more details. A list of “architecture and history” maps leads to separate pages for major destinations and their nearby attractions (such as restaurants, museums, and parks). Nowadays, this is fairly typical but it’s nicely done here. Perhaps the groundbreaking part is in the “Explore” sections. Each section features a map and mural with related places and scenes, along with a short narrative. Click on a place and you’re led to more details with slideshows of historic images and interviews with a variety of people. What’s unusual is that it includes diverse perspectives (such as local historians, residents, preservation advocates, artists, community leaders, writers, biologists, and business owners) and that they’re carefully edited extended interviews (videos are about 3-4 minutes). You’ll find a nice selection in Voices About Recreation in the L. A. River Field Guide. And they don’t shy away from controversial topics, such as social discrimination and declining property values. Furthermore, the content was developed in partnership with local non-profits and businesses. Collaborations like this are difficult but the results are much more holistic and comprehensive, and dare I say it, interesting. Public television hasn’t been considered often enough in the interpretation of historic sites but KCET has shown they offer a new perspective and thoughtful approach in community engagement through history and place. Indeed, I recently facilitated a meeting on rethinking an historic house museum and one of the most thoughtful participants was from the local public television station. So if you’re thinking about expanding or reinterpreting your site, consider including someone from public television or radio on your advisory committee or adopting some of their tactics in your planning. 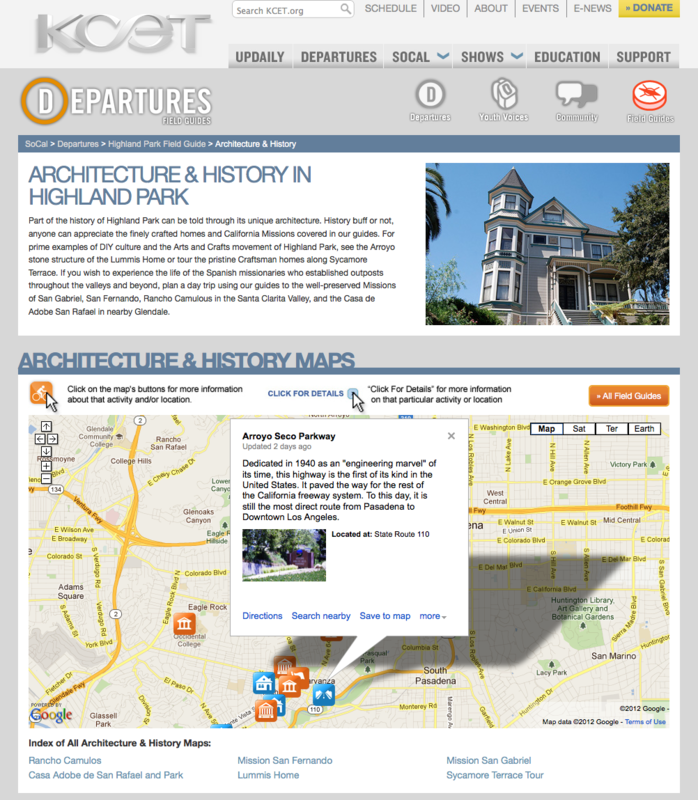 This entry was posted in Community engagement, Historical interpretation, History, People, Social media, Technology and tagged Departures, Highland Park, KCET on February 13, 2012 by Max van Balgooy.